Antiviral Drugs Pharmacology | Comprehensive Database of Facts! Antiviral drugs are part of the broader family of antimicrobial drugs. There are many different classes of antiviral drug. 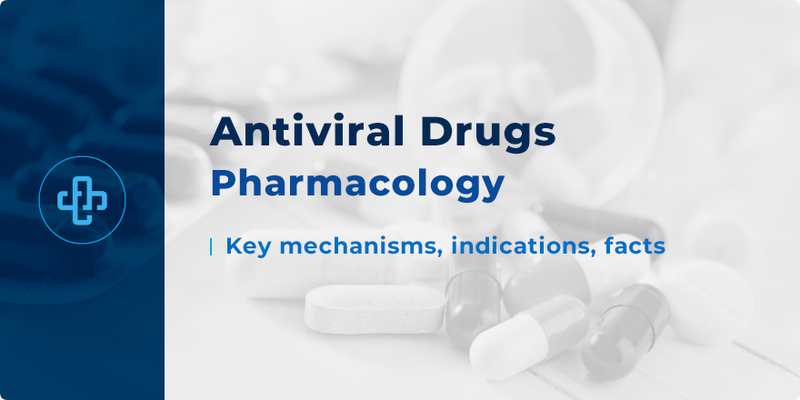 Here, we review those classes – examining the key facts of antiviral drugs pharmacology that you need to know. Most antiviral drugs have one target. Some antiviral drugs have broad-spectrum of activity. One of the primary differences between antibacterial and antiviral drugs is how they act toward the target pathogen. For example, a great many antibacterial drugs are bactericidal – namely, that they actively seek out, destroy and kill the target pathogen. The same cannot be said for antiviral drugs which instead inhibit viral development. For this and other reasons, treating viral infections is more challenging than treating bacterial infections. Many bacterial infections can be treated quickly and effectively. Treatment is targeted and patient response ismore predictable. Designing effective antiviral drugs is challenging because the virus uses the host – or us – to replicate. This means targeting ‘viral cells’ becomes synonymous with targeting host cells. Variation within viruses only adds to this complex web. Nevertheless, a wide range of effective antiviral drugs have been developed. In the case of hepatitis C, for example, many new drugs – such as sofosbuvir / ledipasvir – have been developed with a cure rate greater than 95 percent. In addition, we’ve added other indications / clinical uses of specific medicines where necessary. Entecavir NRTIs must be activated to the triphosphate form to be incorporated into viral DNA; a phosphorylation step carried out by kinase enzymes found in cells. Adefovir Nucleotide analogs act as chain terminators for viral and host DNA. Recall that both drugs end in –fovir. Rilpivirine NNRTIs can be identified through the presence of –vir– within the name of the drug. Raltegravir All integrase inhibitors end in the suffix –gravir. Tipranavir All HIV protease inhibitors end in the suffix –navir. Protease inhibitors are also used to treat other viral conditions, such as hepatitis (see below), but the suffix that identifies those drugs ends in -previr. Ritonavir is used in smaller doses to boost the effects of other protease inhibitors by inhibiting CYP enzymes. Reduced doses mean reduced adverse effect profile. CYP3A inhibitors Cobicistat Acts in the same capacity as ritonavir – namely, that the drug is used to inhibit CYP enzymes that otherwise metabolize HIV drugs. This means lower doses of HIV drugs may be used to achieve the same clinical effect, whilst reducing side effect burden. Cobicistat is typically combined with other HIV drugs, such as elvitegravir or atazanavir. Unlike ritonavir, though, cobicistat has no inherent anti-HIV activity. Our next key class in our study of antiviral drugs pharmacology are medicines used to treat hepatitis B infection. You may notice that some of these drugs are also used as antiretroviral medicines. Lamivudine Nucleoside reverse transcriptase inhibitor. Adefovir Nucleotide reverse transcriptase inhibitor. Tenofovir disoproxil Nucleotide reverse transcriptase inhibitor. Tenofovir alafenamide Prodrug of tenofovir; a nucleotide RTI. Telbivudine Impairs DNA replication of hepatitis B virus by causing chain termination. Entecavir Nucleoside reverse transcriptase inhibitor. Pegylated interferon alpha-2a Pegylated version of interferon is long-acting; requiring only once weekly dosing as opposed to once daily dosing with standard interferon. Telaprevir A class of protease inhibitor. Hepatitis C protease inhibitors may be identified through the suffix – previr. Ombitasvir Ledipasvir is part of the combination medicine Harvoni (alongside sofosbuvir). Velpatasvir is available as a fixed-dose combination with sofosbuvir in the medicine Epclusa. Recall – ‘a‘svir – NS5’A‘. Dasabuvir Sofosbuvir is part of the combination medicine Harvoni (alongside ledipasvir). Recall – Sofos’b‘uvir – NS5’B‘. Ribonucleic analogs Ribavirin Guanosine analog that prevents viral RNA synthesis and viral RNA capping; it acts as a nucleoside inhibitor. Recall – ‘rib’a’vir”in’ – ‘rib‘onucleic analog (guanosine); ‘vir‘al infection; nucleoside ‘in‘hibitor. Peginterferon-2b Both drugs act as immunomodulators in response to a foreign antigen. The 2-alpha drug is also used to treat melatonin. Rimantadine A drug used for both antiviral and antiparkinsonian indications. For Parkinson’s disease, the drug works as a weak antagonist at NMDA glutamate receptors. It also increases dopamine release and blocks dopamine reuptake. Recall – aMant/riMant – M2 channel. Zanamivir Neuraminidase enzyme is ordinarily responsible for cleaving sialic acid from glycoproteins on the surface of human cells; a cleaving that allows virions to exit the cell, spread and grow. Recall – ‘mi‘vir – neuraMInidase. inhibitor Baloxavir marboxil Treats both influenza A and B. FDA-approved in October 2018. It inhibits a process known as ‘cap snatching’, in which the first residues of host cell RNA is ‘snatched’ and replaced with viral residues. Valganciclovir Only used to treat cytomegalovirus retinitis in patients with HIV/AIDS or in patients who have recently undergone organ transplant. It is a prodrug of ganciclovir; the triphosphate form being a competitive inhibitor of deoxyguanosine triphosphate (dGTP). When incorporated into viral DNA, it preferentially blocks viral DNA polymerases. Cidofovir Used to treat cytomegalovirus retinis in patients with AIDS. Its active metabolite is cidofovir diphosphate; a metabolite that works by inhibiting viral DNA polymerases. Aciclovir Used to treat herpes simplex viral infections. Aciclovir is converted into the monophosphate form by viral thymidine kinase. The monophosphate form is then converted to the triphosphate form by host kinases. This, in turn, targets viral DNA polymerase to halt viral disease progression. Famciclovir Prodrug of penciclovir. It is used to treat herpes zoster (shingles) infections. Penciclovir Nucleoside analog used to treat herpes infections. Poorly absorbed orally, used topically instead. Valaciclovir Used to treat herpes simplex, herpes zoster (shingles) and herpes B. It is converted to acyclovir in vivo. Imiquimod Used to treat genital warts, basal cell carcinoma and actinic keratosis. Nitazoxanide Broad-spectrum antiviral drug used to treat hepatitis B and C; as well as a range of protozoal and helminthic infections. Its exact antiviral mechanism of action remains unelucidated. Tecovirimat FDA-approved in 2018 to treat orthopoxviruses, such as smallpox and monkeypox. Tecovirimat works by preventing the virus from exiting infected cells. Over 2 million doses have been stored in the US in the event of pox bioterrorism. Many drugs are not taken alone. For example – in the case of hepatitis C, ribavirin is never taken alone. It is always taken alongside a second or third drug to enhance the clinical response. Many HIV drugs and hepatitis C medicines have been formulated as fixed-dose combinations – meaning that more than one drug, often as many as three drugs, are combined into one pill. This is not an uncommon phenomenon in antiviral drugs pharmacology. It has the dual benefit of improving patient adherence and, by extension, clinical effectiveness. Patients who fail to adhere to their regimen are significantly more likely to develop drug resistance. Many drug combinations make use of “booster” drugs, such as ritonavir and cobicistat, which are used not for their antiviral activity (in the case of cobicistat, no antiviral activity whatsoever), but rather for their ability to inhibit CYP enzymes that otherwise metabolize antiviral drugs. This means that lower doses of antiviral drugs can be used to achieve the same therapeutic effect, with the added advantage that those lower doses cause fewer adverse effects. That about completes our summary of antiviral drugs pharmacology! For even more facts and quiz questions about the pharmacology of antiviral drugs, take a few minutes to become a registered member! Check back to our pharmacy blog soon for even more great facts about antiviral drugs.